Our mission, you may already know, is to help teachers magnify the majesty of God. We teach the Bible with an exaltational, God-focused approach, which you can read more about here. We’re a nonprofit publishing ministry with dedicated professionals and academics who aren’t concerned with return on investment. We’re here to help show students Christ. But why do we make Bible curricula—that is, complete studies designed as an academic subject? What does a Bible curriculum offer to a student that isn’t normally found in a devotional book or a Sunday School class? To understand our passion, you’d need to stop by our campus for a cup of coffee and a long conversation—seriously, email us and plan a visit—but here are a few quick thoughts. Kids need a relationship with God. Covered this before, but our greatest need is to connect with God. No Bible curriculum or Bible study is worth anything unless it focuses our attention on our Father. He is our only hope, our only joy, and the only catalyst for spiritual growth. But if we view Bible study as part of a relationship, why then do we formalize it? Won’t that seem stale? Kids need time with the Word. A robust Bible curriculum encourages students to put serious time and thought into their study. It poses questions and ideas that cannot be tackled quickly. 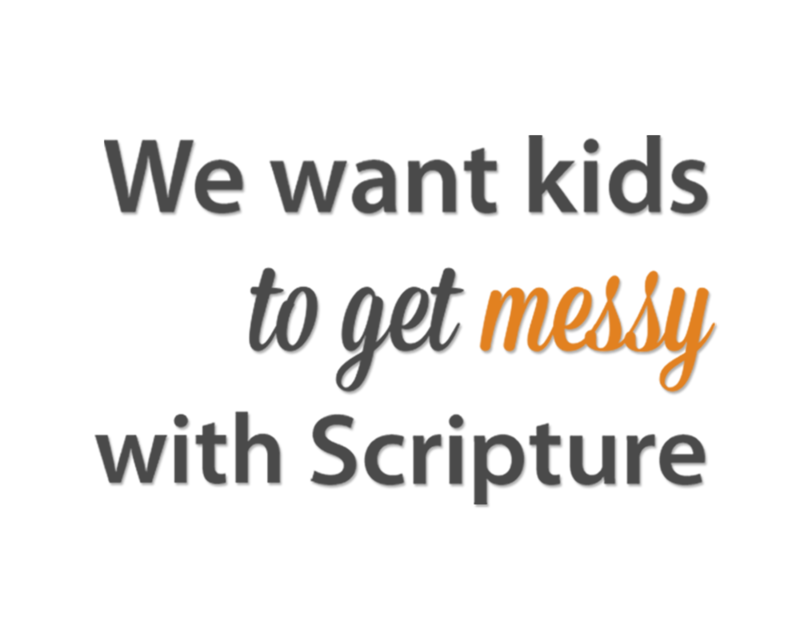 We want kids to get messy with Scripture—to dive into language and context and culture and to lose hours studying the truth they find. Over time, we want them to realize the benefits of giving God significant, intentional, focused time every single day. That’s difficult at first, but like good exercise and healthy food, it’ll be habit-forming. We build teacher lessons into our curriculum because we believe that God uses personal discipleship to grow His children. While the bulk of Bible study rests in the hands of students, they should learn to listen and evaluate truth presented by older, more experienced Christians. Spiritual growth is often a group effort, and you, the teacher, should trust God to shape you along with your students. And by His grace, you can reflect His light with a greater flexibility and sensitivity than would a video or textbook alone. But kids need that “aha” moment alone. I wrote before of our struggle to let the Spirit work in our children—because we can’t enforce growth and change. What do you see of God’s work in this passage? How does this relate to the attribute of God we studied earlier? In what ways can we reflect this facet of God’s character? This drives kids deep into Scripture, where they learn not just facts and stories, but themes and theology. There the Spirit gives them that flash of inspiration, where they stand in wonder of God and long to share Him with others. Kids need reasoned, balanced exposition. Many Bible studies and classes are topical—that is, they take an idea or application and collect all the Scripture that relates to it. These can be helpful (what does God have to say about relationships or outreach or grace? ), but they don’t teach kids to study passages as they were meant to be—line by line, with an appreciation the greater meanings of Scripture. Exodus, for instance, isn’t a collection of morality tales and strange rules. It’s a story of God showing mercy and grace to His imperfect children during a critical moment of their history. And Galatians isn’t a batch of inspirational quotes—it’s a hard-hitting argument to rely on God for both salvation and sanctification. It defends the gospel of grace against false gospels of self-righteousness and despair. That’s why most of our curricula are expositional. We study each passage for its own sake, thereby avoiding some of the denominational hotspots that cause divisive discussion. And wherever an issue is unavoidable, we’ll make a case for what we believe, but also hopefully give students the tools they need to decide for themselves. Kids need context and depth. Most Sunday School teachers don’t have time to stop in the middle of a lesson to review the etymology of a Greek word or explore the history of a Phoenician city. But kids are lore-masters at heart. By tying biblical truth to language, history, geography, philosophy, even math, we can cement God’s Word in the immediate. We can reveal the eternal in the temporal. Just as David shared God’s truth through the beauty of song and natural imagery; just as Christ revealed Himself through stories and pointed questions; just as Paul cited poets and the altar to the Unknown God—we can train up kids that will never view theology as abstract or detached. When others question your students’ relationship with God, they’ll respond by sharing the love of their Father, who is as real and close as the ground they stand on. He is their rock, their hiding place, their fortress. This one is difficult, especially for teachers who just want to make it through the day. But deep Bible study isn’t easy, and if kids don’t struggle with the hard questions now, they will later—perhaps when they’re not connected to a good Bible teacher. This is why, in contrast to some Bible studies, the exercises in our curricula can be challenging. Students might be asked to follow an argument or theme through a passage, or root out an historical detail that will be significant later on. They might even be given an impossible question—why do you think God did what He did in this passage?—just to teach them the gaps in our human understanding. The goal, however, is not to discourage, but to uplift. Our studies teach God-focused trust, helping students to be comfortable with some necessary ambiguities, but also driven to explore the truth that only God can reveal. And why do we offer tests and related materials? Simply to provide teachers with the resources they may need to meet the assessment requirements of an academic subject. We don’t try to test for spiritual growth, but teachers can see if a student has mastered the content. Are there other goals you have when teaching the Word to your children? Do you see ways we could better pursue our mission? I’d love to hear from you, either by email or in the comments below.